In research it is not uncommon to be looking for a particular piece of information and stumble upon other interesting (though unrelated) information. This happens to me quite often and I have learned to quickly make a copy of the surprise find so I can come back to it later. 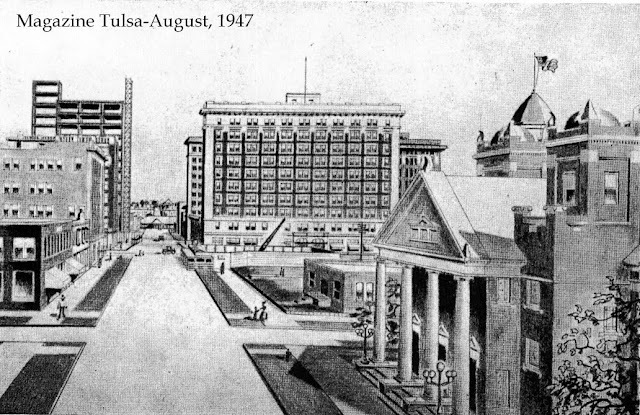 In the following post, I had been looking through old Magazine Tulsa issues, doing research for a previous exhibit at the museum, and came across this drawing and article. I have inserted some other photos for interest. 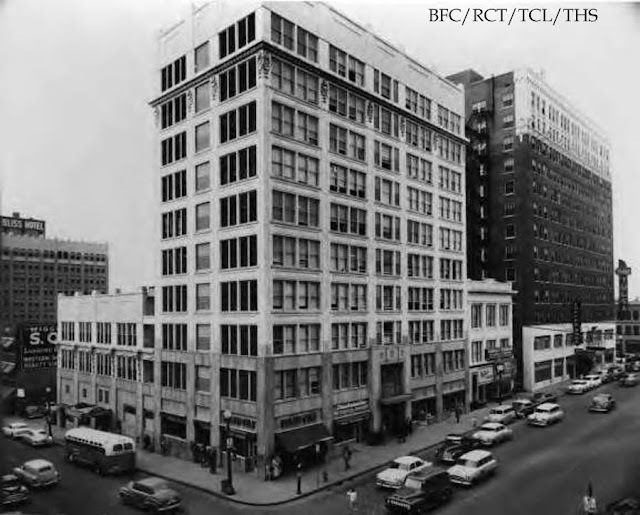 was sold to Dr. Kennedy who more than doubled its Boston Avenue frontage to make the present day Kennedy Building. Across the street on the southeast corner, evacuation was already underway for the new Cosden Building which would then be the tallest in the state. was the first office structure to be erected in the block which had- since 1907- been the playgrounds around “Old Central” (high school). 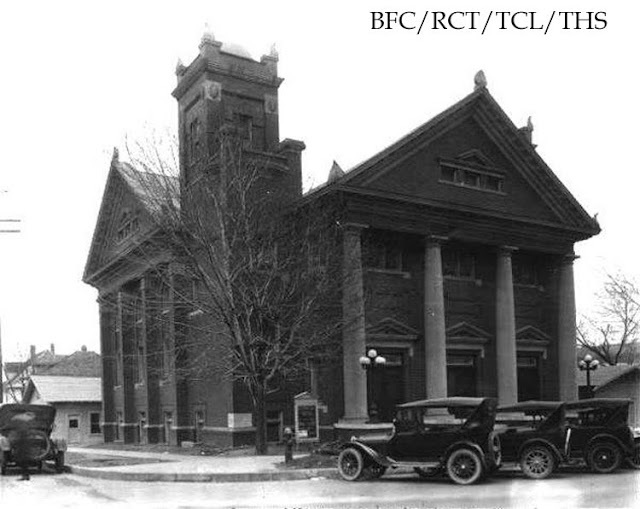 In the drawing, “Old Central”, with the flag flying atop the mast, can be seen rising above the twin towers of the Boston Avenue Methodist Church in the right foreground. 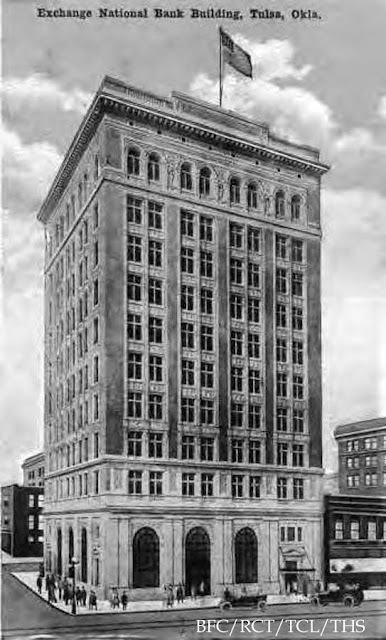 while at 3rd, the first unit of the Exchange National Bank is being erected. 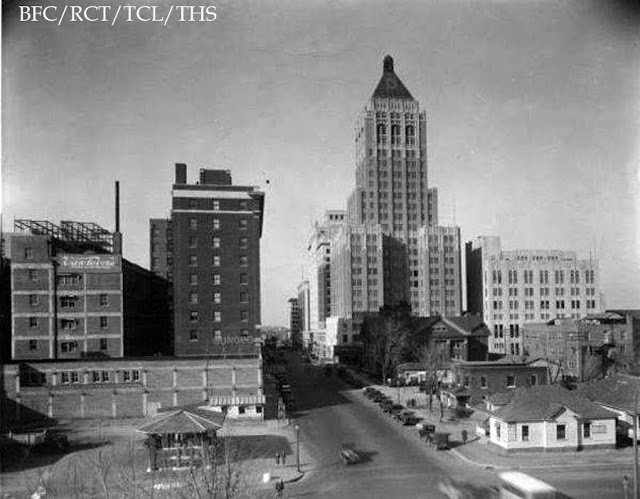 Behind the Gallais Building can be seen the Daniels Bldg and Hotel Tulsa, the first ten story buildings erected in the city. 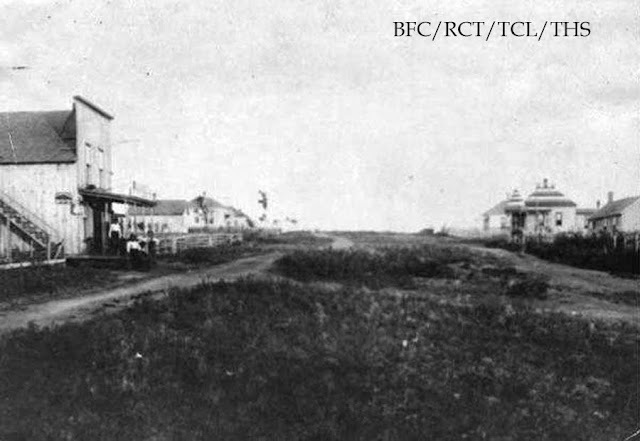 In those days Boston Avenue was blocked to the north by the Frisco Station which stood directly astraddle the street at the Frisco tracks. 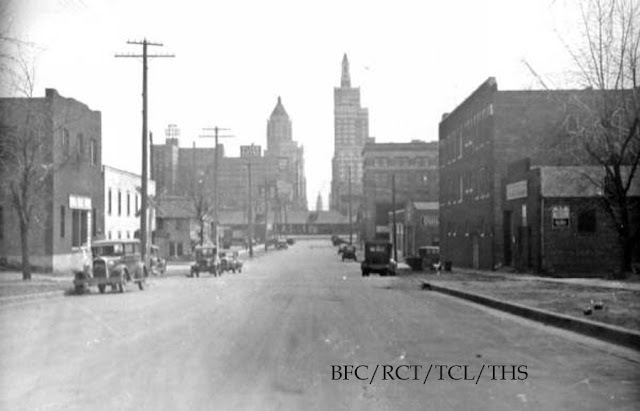 Researching Tulsa's old movie theaters is something I've been attempting to do for a few years now; originally for an educational presentation and then for my own interest. 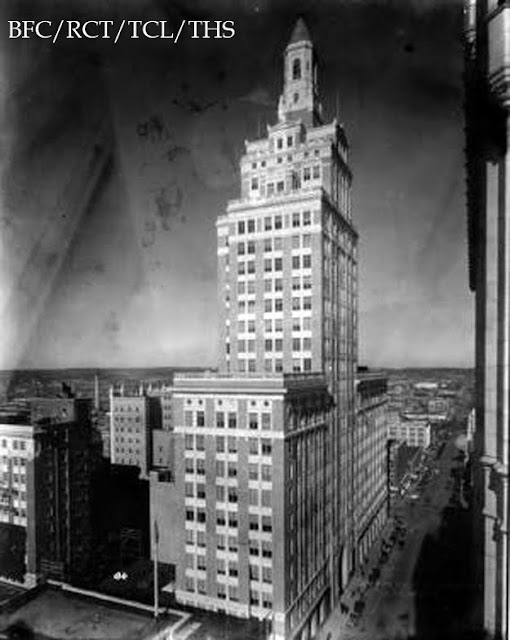 I love a good mystery, and the Rialto proved to be one. 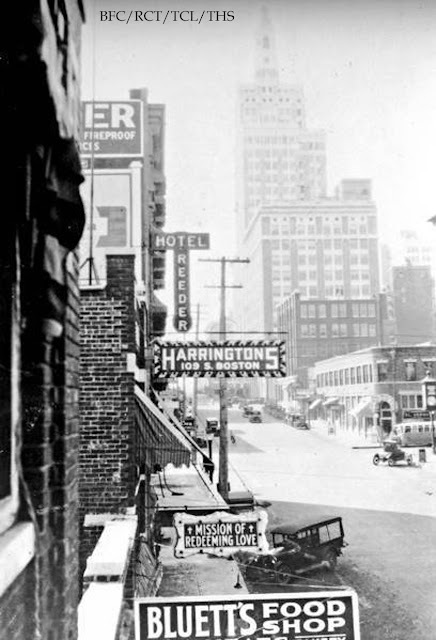 It is challenging enough that the original vaudeville theaters changed names, owners and addresses very often. Then, as moving pictures arrived on the scene, things got even more complicated. Thankfully the photos from the Beryl Ford Collection help prove locations at certain times. However, there has been a lot of information lost over the years and misinformation spread around as fact. 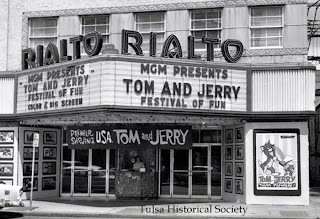 Recently I happened upon some more information about the Rialto as I was helping get the new exhibit (on theaters) ready at the Tulsa Historical Society and I believe I finally have the Rialto's history straight. If not, I have no doubt I will be informed quickly! 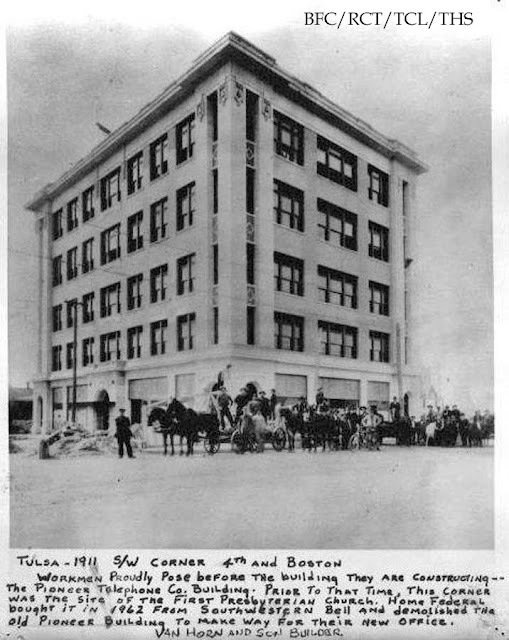 *The original Empress Theater (vaudeville) moved into the former Tulsa World Building at 15 W 3rd around 1914. 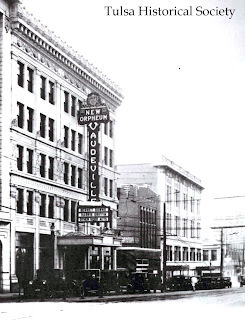 In 1916, the Empress is listed in the city directory as being (next door) at 7 W 3rd. 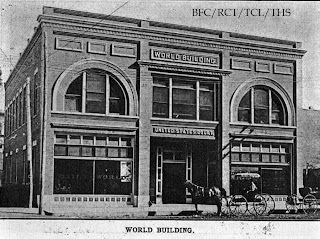 My guess is the owner, Mr. Smith, decided to remodel the 15-13 building and also owned this building as well. 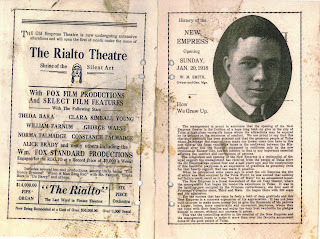 *In 1918, the "New" Empress moved back into a newly remodeled 15 W 3rd (again as a vaudeville theater) and the Rialto was opened (as a moving picture theater) next door in the 7-11 building. and the Rialto moved into it's old home at 15 W 3rd, making room for the new Kress building in its old spot. The Rialto remained here until it's closing and demise in the 1970s. It is between this and the city directory listings that I have made my assumptions. 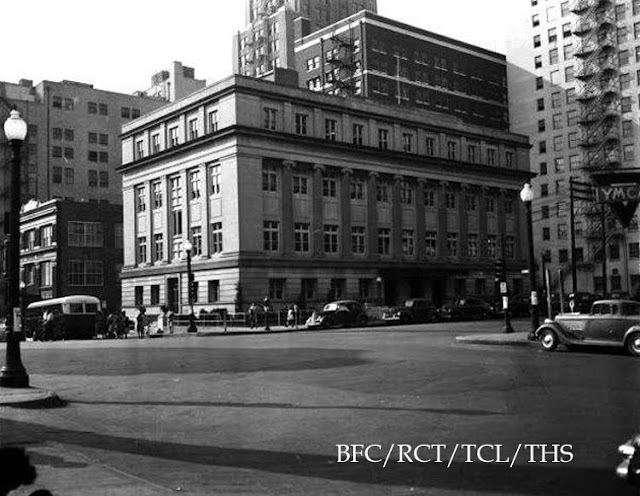 The new exhibit at the Tulsa Historical Society features the Rialto and 8 other theaters in photos. 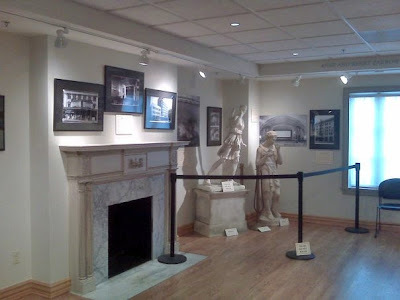 Also, statues from the Ritz and Orpheum are on display. 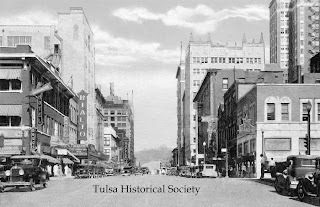 The Historical Society is located next door to the Tulsa Garden Center; hours are 10-4 T-Sat. 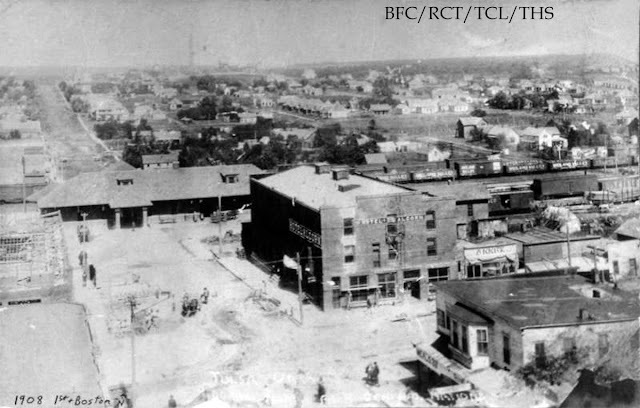 Amusement parks with rides, concession stands, dancing and roller coasters have been around the Tulsa area since 1905 starting with Orcutt Park. In west Tulsa, the Electric Amusement Park had opened by 1921 and also featured a dance hall, rides, swimming and a memorable miniature train. 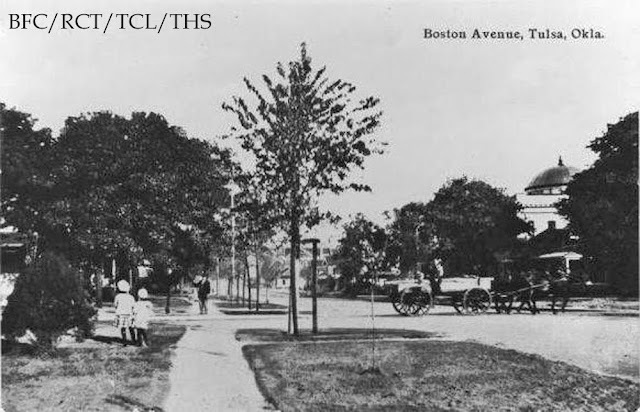 By 1922 the company contracted to operators of carousel and Ferris wheel rides. In 1929 Crystal City was established next to Electric Amusement Park and eventually absorbed it. The owner, Mr. Falkenberg added more rides including the large Zingo roller coaster. My grandfather took this photo of my grandmother at Crystal City around 1943. 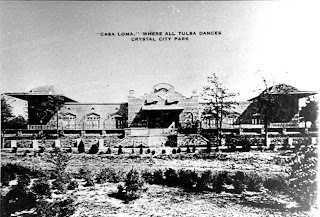 The park's popular Casa Loma dance hall and the bath house burned down in the mid-1950s. The park soon disappeared after that. Many of the rides were installed at another one of Tulsa's facilities- Lakeview Amusement Park which was near the zoo at 4100 N. Harvard. 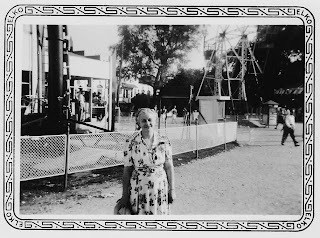 Other Parks: The Sand Springs Amusement Park, began in 1911 and lasted through the mid-1930s. There was the Skyline Amusement Park near Jenks which lasted through the mid-1950s and Tulsa’s Bells Amusement Park, which opened in 1951. Their Zingo was built in memory of Crystal City’s old Zingo. Bell's was forced to shut down in 2006 and is sorely missed by many. 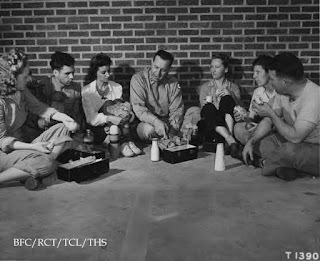 Adaline attended the historical Tullahasse Creek Mission that Reverend R.M. 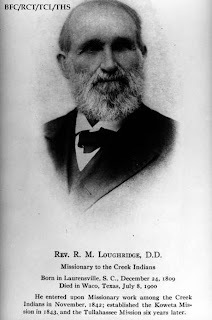 Loughridge had established in 1850. While there, she was elected to travel with the Reverend and his wife to Carlisle, PA on business. They traveled by train and then wagon. Adaline spoke 3 Indian languages and served as an interpreter. This was something many in her family had done. 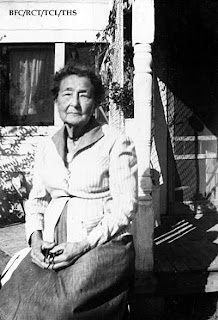 Her uncle, David M. Hodge, was noted for his translation of the Bible into Creek language, published a dictionary and grammar of the Creek language with Loughridge and served in Washington as a delegate from the Creek Nation. Her sister, Clarissa Hodge Perryman Richards, once owned the land where Hillcrest Hospital now stands. 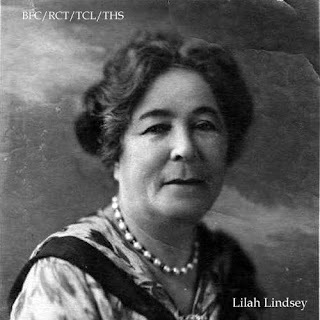 Adeline’s cousin was Lilah Lindsey; both of them were members of the Perryman Family. Both were great contributors to the city of Tulsa and their Creek heritage. 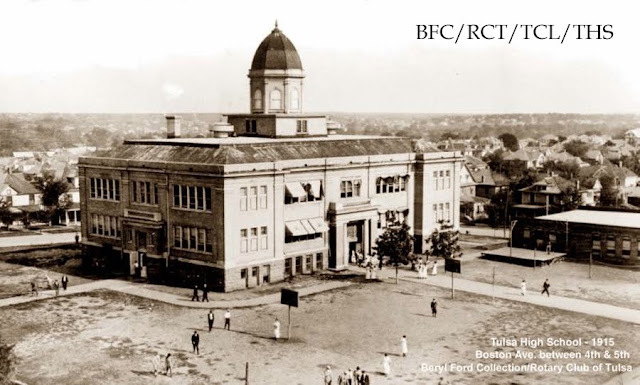 Last July I blogged about one of Tulsa’s founders, Colonel A.D. Orcutt. I mentioned his 2nd wife, Adeline, and noted that I would write more about her at another time, which I will. But first, a little of her family history. A descendant of Benjamin Perryman, Alvin T. Hodge was born on April 15, 1845 in Choska, Indian Territory. 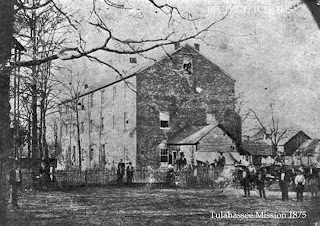 Educated at the Tullahassee Mission School, he married Mary Jane Burgess, a Cherokee and together they had 9 children, with Adeline being their oldest child. Alvin was a farmer and stockman, and one of the wealthiest of the Creek Indians. 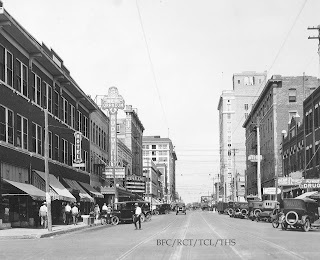 "My father owned just about all of Tulsa (county)" his daughter was once quoted as saying. 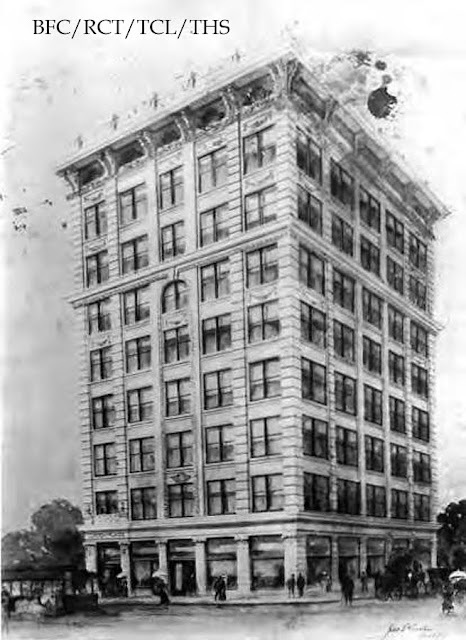 In 1884, a couple of years before Adeline’s marriage to Colonel Orcutt, Alvin Hodge moved his family to Tulsa and built a small dwelling near Third and Main. 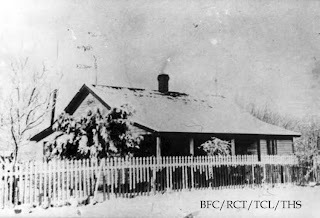 Soon he was appointed special Judge by the Creek Nation Council and built a farmhouse at what is now 8th and Elgin Ave. He fenced in a pasture beginning at Elgin and running east to Lewis and pastured cattle there. Adaline recalled their nearest neighbor being George and Rachel Perryman. In 1887 Principal Chief L.C. Perryman of the Muscogee (Creek) Nation appointed Alvin as a District Inspector for the Coweta District. 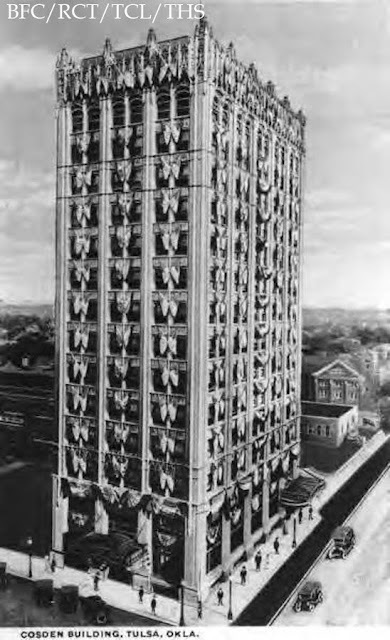 He then built a home at 8th and Detroit. 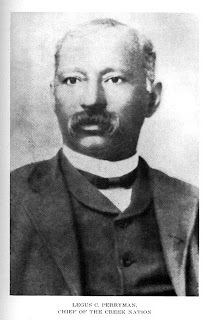 In 1900 Alvin Hodge served on two committees in Tulsa: Streets & Alleys and Public Improvements. 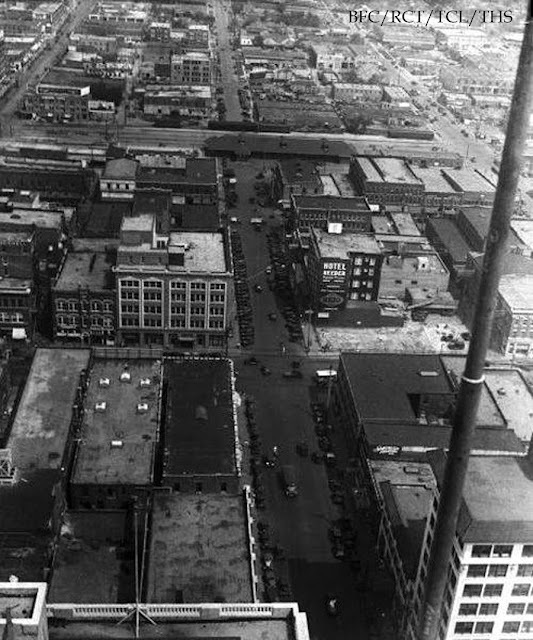 Since he was a pioneer of Tulsa, Hodge Street (now known as First Street) was named in his honor. In 1903 he developed a residential area in Tulsa and also during this time he gave to the City land for “cemetery purposes only” which is today called Oaklawn Cemetery. 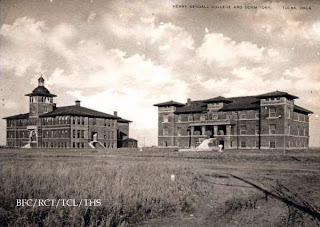 In 1905 Hodge sold land to the Methodist Church for the relocation and construction of Kendall College, now known as the University of Tulsa. He retired to his farm in Coweta and there he died at the age of 74 in 1919. Both he and his wife are buried in the Hodge Family Plot in Oaklawn Cemetery. 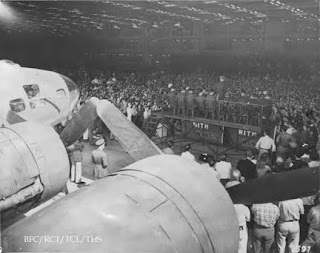 Air Force Plant 3, also known as the Tulsa Bomber plant, was dedicated on August 15, 1942. Located on 750 acres east of the municipal airport, the 4004-foot-long and 200-foot-wide assembly structure provided over 800,000 square feet of floor space. A Burlington Northern RR spur line brought the raw materials and partially assembled aircraft into one end of the building, and completed aircraft emerged from the other end. The plant operated under blackout conditions. 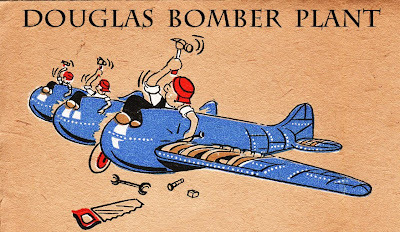 These are some of the workers on a lunch break: During WW II, the plant was run by the Douglas Aircraft Company, producing A-24 Dauntless dive bombers, B-24 Liberator strategic bombers, and A-26 Invader medium bombers. 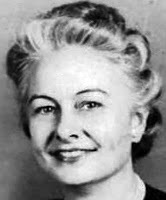 My grandmother, Elva Robertson, came to Tulsa in 1942 from the Beechcraft Plant in Wichita where she had trained, worked and eventually taught. 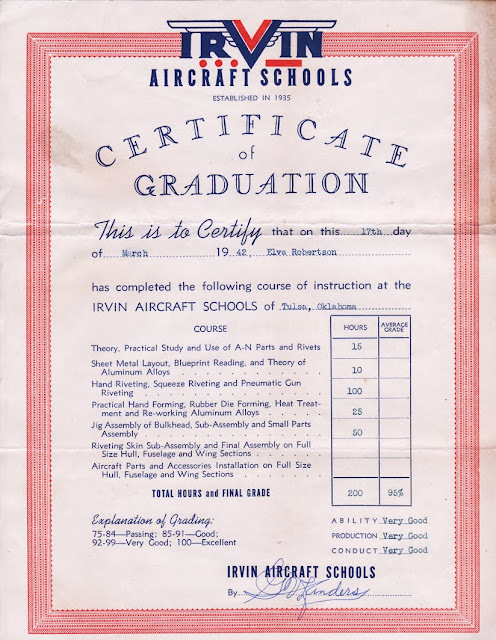 She took classes at Irvin Aircraft Schools here in Tulsa, 1115 S. Harvard Street. 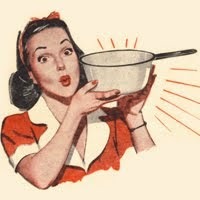 This was probably in preparation for her new job at the Tulsa Plant as an inspector. 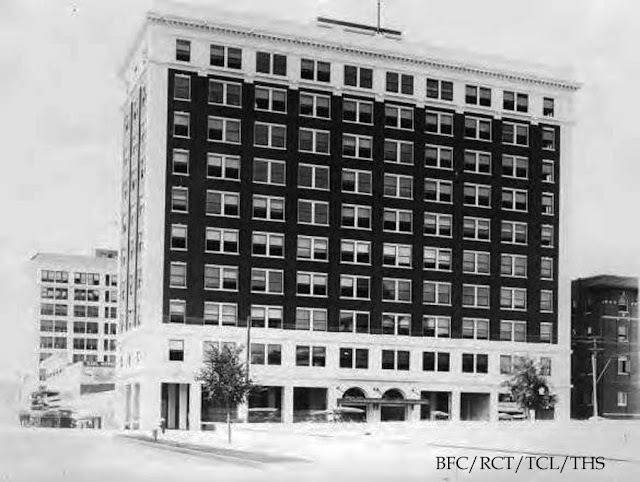 When she first came to Tulsa, she lived in various hotels downtown as did many. 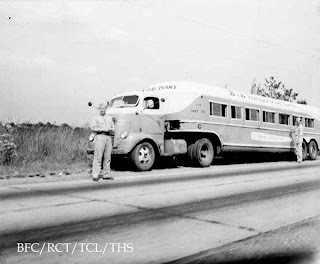 From the Beryl Ford Collection: B & B Transportation offered a service that transported 60-70 workers from 10th & Boston to the various shifts at the Douglas Air Plant. This is a semi truck pulling a trailer which served as a train coach. This service began in 1942 and ran until the end of the war. 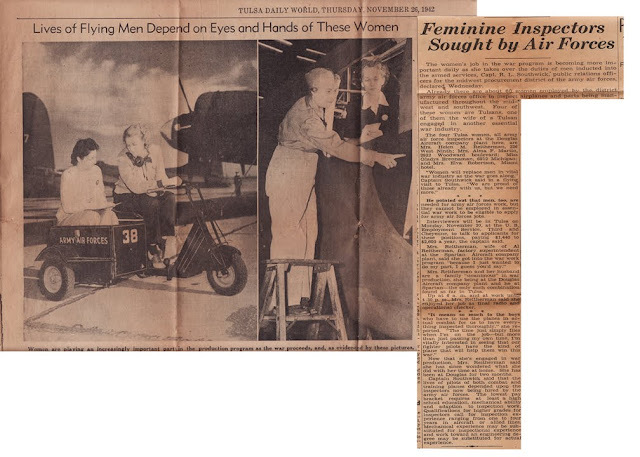 An article ran in the Tulsa World on November 26, 1942 about the women who worked at the plant here. “We are working 10 hours a day. I also go to school 2 hours every night then I go to an instruction class 2 hours every morning on company time. 15 women out of about 2,000 were selected to train new employees…..
“I’m still the only lady inspector on final assembly, but I expect we will get some before long. I’m just mentally fatigued as well as physically- it’s such a strain all the time for fear- you’ll pass something up and endanger someone’s life.